I call this a summer soup because it's served cold. 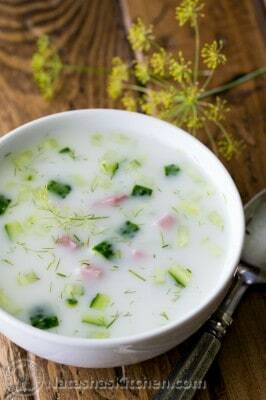 It's very refreshing to have chilled soup on a hot summer day. I can eat three bowls of this on a hungry stomach. (A mom who chases after a 1-year-old gets hungry ok?!) It's relatively guilt free; no butter or oils required. Easy, cheap and healthy; that's my kinda meal. Peel potatoes and dice them into 1/4" cubes (we used the Vidalia Chopper). Place diced potatoes in a medium pot and cover with water. Add 1 Tbsp vinegar and bring to a boil then continue boiling for 10 minutes or until the potatoes are cooked, but not falling apart. Drain well and set aside to cool. For quicker cooling, you can rinse potatoes with cold water. (This cooking method is thanks to one of my readers - Nadia). While potatoes are cooking, boil 3 eggs and cool them in ice water. Next, dice 3 eggs, 3-4 cucumbers, 1/2 lb of ham. Also chop 3 Tbsp of dill and 1/2 cup of green onions. Place everything in a large pot. In a separate large bowl, whisk together 8 cups of cold water, 1/3 cup of sour cream, 2 1/2 Tbsp of vinegar, 2 1/2 tsp of salt until combined. Pour the mixture in the pot with the rest of ingredients. Stir to combine and serve.